From old fashioneds to custard-filled longjohns, from glazed yeast donuts to apple fritters, Columbus does donuts and we do it well. Here’s your complete A to Z guide to Columbus donuts. Amy’s on the West Side features a colorful selection of pastries topped with everything imaginable: candies, cookies, marshmallows, fresh fruit, bacon, cotton candy - you name it. It’s a delight just to walk in and look through all the display cases! The Angry Baker’s two shops – cafes in Olde Towne East and Victorian Village – cater to vegan and gluten-free donut lovers, although their pastries will appeal to everyone. Their selection varies from seasonal pumpkin spice to strawberry to vanilla with chocolate ganache and beyond. Auddino’s is a family-run Italian bakery creating breads and rolls for area restaurants. Their retail bakery, tucked down a side-street near the Ohio Expo Center, features classic styles of donuts. Their signature is the doughssant, a fried and glazed croissant they’ve been crafting since the early ‘90s. This Japanese bakery on the northwest side makes everything from scratch and creates flavors you won’t find elsewhere in Columbus. Try dense yeast-raised donuts flavored with curry or sweet red bean paste. This shop pops up at seasonal farmers markets with their colorful creations. In the off months, find them at Highline Coffee and the Hills Market in Worthington. This campus classic has been serving Ohio State since 1969. They’re open 24/7 and make donuts the old school way – all by hand. Try their seasonal cake donuts like pumpkin or red velvet, or go for the signature Buckeye Donut, the German chocolate or the maple bacon longjohn. Sit at the counter with a donut and a coffee at this south side institution and you’ll feel like you’re stepping back in time. Though not owned by the same family as the campus stop, this Buckeye Donuts is also open 24/7 and makes all the classic styles by hand. Cherbourg’s adorable Bexley cafe is a perfect spot to cozy up with coffee and a pastry on a cold morning. The dedicated gluten- and nut-free bakery includes donuts with cinnamon, chocolate and seasonal flavors on their menu. The award-winning Destination Donuts has a home inside the North Market. It’s nearly impossible to walk by their colorful display and not pick up a couple of their giant yeast-raised beauties. They run through flavors like cookies and cream, butterscotch, apricot pistachio, lemon triple berry and more. DK is a Grandview staple, a diner and donut shop where the walls are plastered with Grandview schools paraphernalia. The “DK’ stands for “Donut Kitchen,” and their hand-made donuts are amongst the best in the city. Specialties include the old fashioned sour cream donuts, giant longjohns with vanilla cream and softball-sized apple fritters. Hailing originally from the Outer Banks of North Carolina, the Polaris (and soon Dublin!) Duck Donuts has local owners. 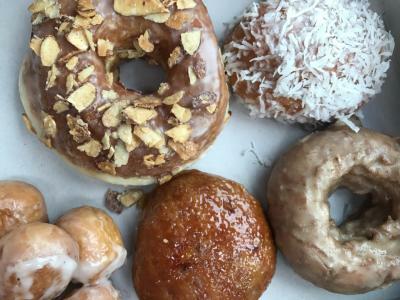 They fry up a simple, not-too-sweet yeast donut as a base, then let you choose from glazes, frostings and creative toppings. Kids can even order a donut and a carton of milk, served on a frisbee to take home! Amongst Fox in the Snow’s beautiful spread of tarts and muffins and cinnamon rolls, you’ll usually find their dense, sugar-dusted yeast donuts filled with chocolate or vanilla custard. Golden Donuts on the south side is another throwback, a donut shop pumping out the classics for years. Stop by for a mixed dozen or grab a seat at the swiveling stools by the long, low counter and order an omelet or French toast. Like all old school donut joints, HoneyDip has its legions of fans. Located on Kenny Road on the northwest side, the donut shop renovated a few years ago to add a bigger dining room and full breakfast menu. Enjoy chocolate-iced glazed donuts, longjohns, cinnamon rolls, or take your donut love to the next level with a donut breakfast sandwich: egg, cheese and bacon or sausage sandwiched between two glazed donuts. Jolly Pirate locations used to dot the central Ohio landscape, but these days they’ve dwindled to three: Grove City, Reynoldsburg and Newark. Many of the old franchises have closed or been converted into different shops, like HoneyDip or Buckeye Donuts. The remaining locations still have that classic look: tiled floors, low counters, and wire trays lined with donuts. Get some to go and they’re packed in a box that looks like a treasure chest. Lil Donut factory is a tiny family-run spot in Hilliard, delighting with beautiful selections hand-made every day. Watch them on social media to see what they’re whipping up each day, but really, you can just show up and trust they’ll have something you love. Just get there early – they tend to sell out! 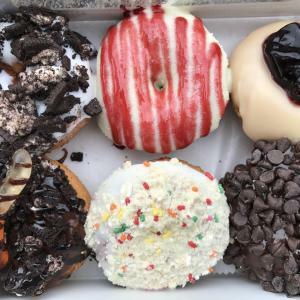 The Little Donut Shop near campus fries one base type of cake donut, then coats them with fun toppings like crushed cookies, candies, maple bacon, powdered sugar, chocolate pretzel and other seasonal tastes. This little bakery on the Hilltop bakes cakes, breads, cookies and a selection of donuts, from fritters to chocolate- or vanilla-iced yeast donuts, pumpkin spice and French crullers. The Goodie Shop has been a favorite of Upper Arlington residents for decades. Find it in the Tremont Center in Upper Arlington, near other community favorites like Huffman’s Market and Chef-O-Nette diner. 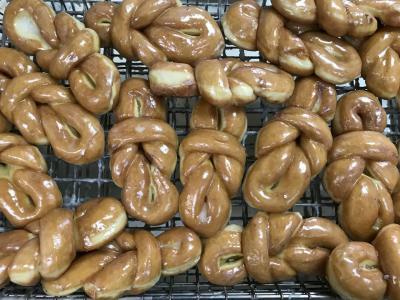 They specialize in cookies and cakes, but their donuts can’t be missed, from the cake stick donuts to the glazed twists to the cinnamon sugar raised donuts. 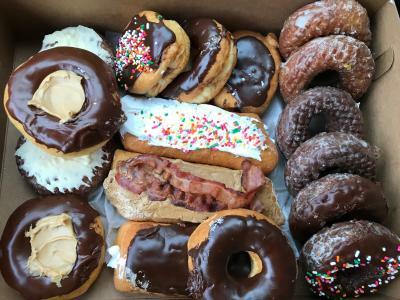 Much like Duck Donuts or the Little Donut Shop, the groovy Peace, Love and Little Donuts in Old Worthington crafts tiny cake donuts that they dip and glaze with fun flavors. Check the display cases to see what they’re making; try the chocolate dipping in chocolate chips, vanilla topped with Fruity Pebbles or the blueberry pancake donut. Resch’s has been making the good stuff since 1912! The sixth generation of the family works their East Side bakery, where you can order cakes and breads in addition to donuts. They excel at the old school varieties: twisted glazed yeast donuts, cake donuts covered in chocolate or the popular nut-topped cinnamon rolls (called the granny roll when drizzled with white icing!). Schneider’s is the neighborhood favorite for Westerville. Their Uptown storefront is the place for cookies, cakes, breads and loads of donuts. They’re known for their Davy Crockett (a cinnamon twist with maple icing) and Nut Toppers (a glazed cinnamon bun with white icing and peanuts). Schneider’s also serves the Celebration Donut, a 10-inch yeast-raised donut that serves up to 20 people. They also open around 1 or 1:30 a.m. Tuesdays through Saturdays, with Otterbein University students lining up in the middle of the night for fresh donuts. Tupelo is a donut shop coming soon to Clintonville, but while they build out their space they park their bright turquoise truck, Tilly, in different spots around the city. 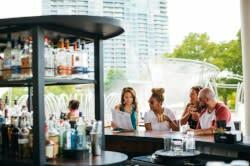 Try their crème brulee donut, the rosewater almond or the orange cardamom donut holes.